Home of the Swallows! | NJNA is Blogging! 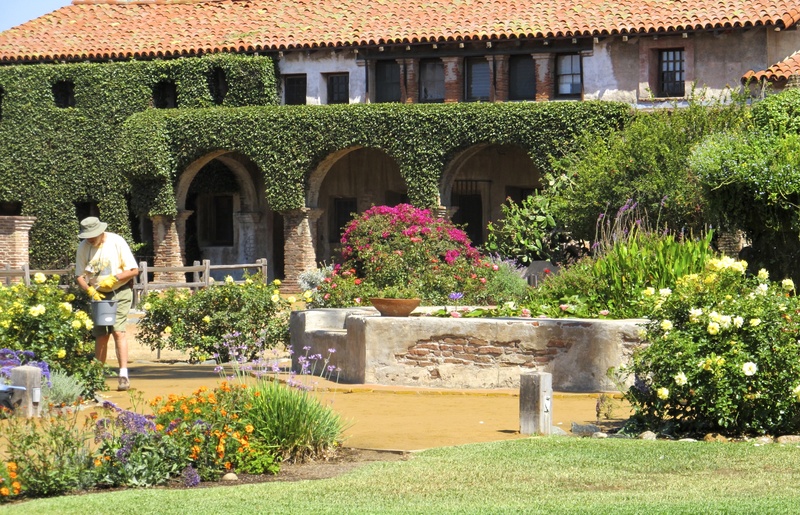 Today Sue and I went on one of the sponsored ANG tours to Mission San Juan Capistrano. Ready to Board the Minibus! First off, let me say that of the eight tours offered at this seminar (four on Saturday and four on Wednesday) — only two had enough participants to go ahead. On Saturday, One Thousand Flowers: Clay Millefiori Sculpting was offered here at the hotel. Today, Home of the Swallows was the only tour that ran. And out of over 400 attendees at seminar — only 14 people took this tour. It makes me wonder about tours for future seminars if participation rates are so poor. So, the good thing about our tour — there were only 14 people! :-)! 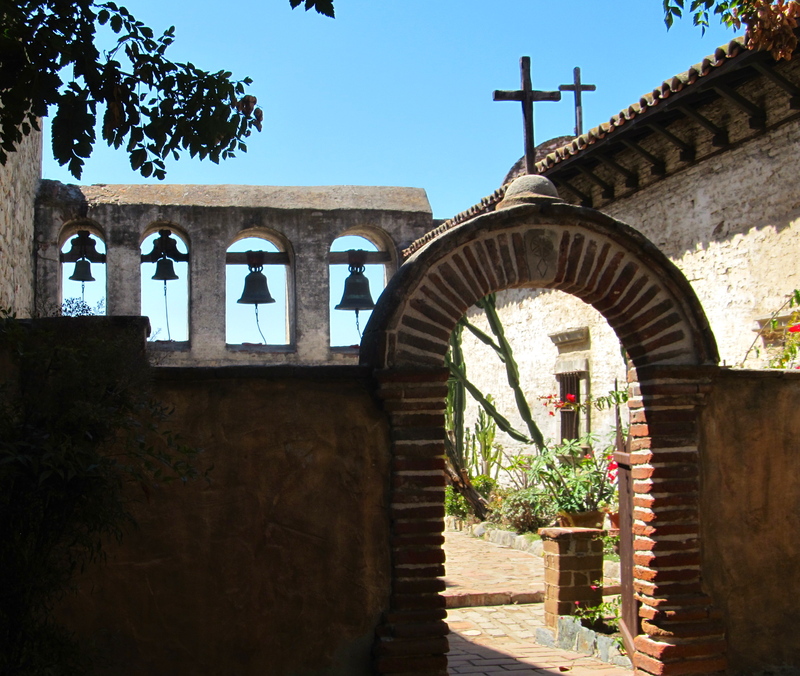 We boarded a luxury minibus at the hotel and about 45 minutes later, we arrived at the Mission San Juan Capistrano. You can see that we had a beautiful day for this! We were quickly escorted inside and assigned a private docent for our group. 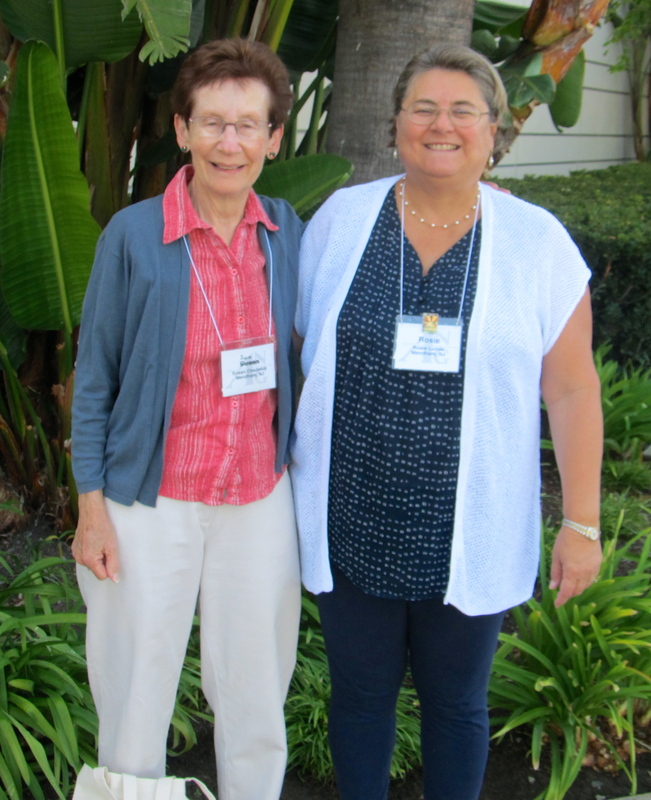 She took us through three separate areas of the mission — one for the Spanish soldiers, one for the Native Americans, and one for the Priests. 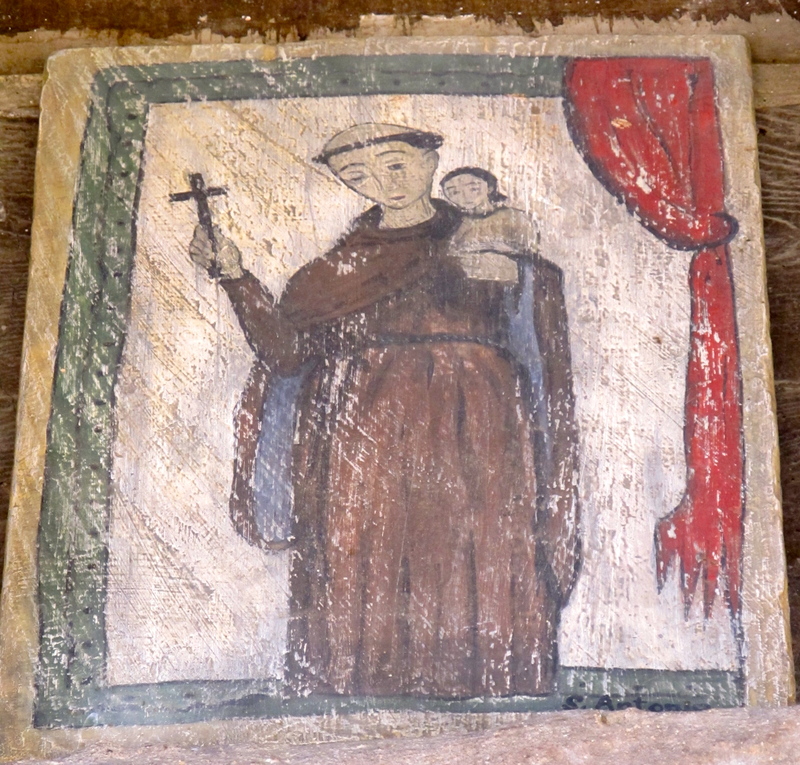 Here’s a lovely picture of Father Junipero Serra — the founder of the mission. We heard the wonderful story of the Swallows at the Mission. Swallows are rather messy birds and the merchants in town were irritated about the debris, so one of the priests invited the birds to make all the mess that they desired at the mission — and the next day the birds came and took up residence! And legend has it that the birds return every year from Argentina — on March 19! Our docent showed us through an old mission church (where I did some more needlepoint research!) and then we walked around to the old stone church. 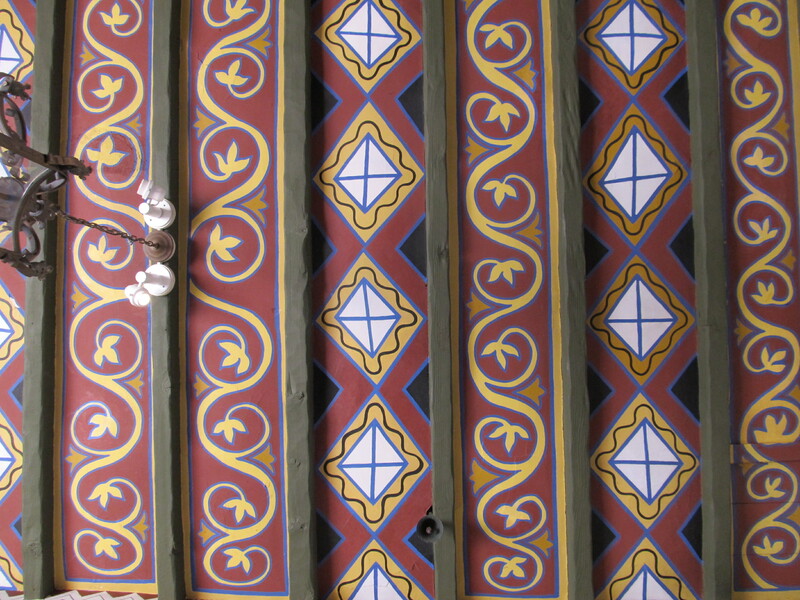 Ceiling in the Mission Church — and Great Needlepoint Border Ideas! The old stone church took nine years to construct, but was destroyed after six years by an earthquake. Many people perished inside the church and only a few walls remain now. We were asked if we felt any ghosts! 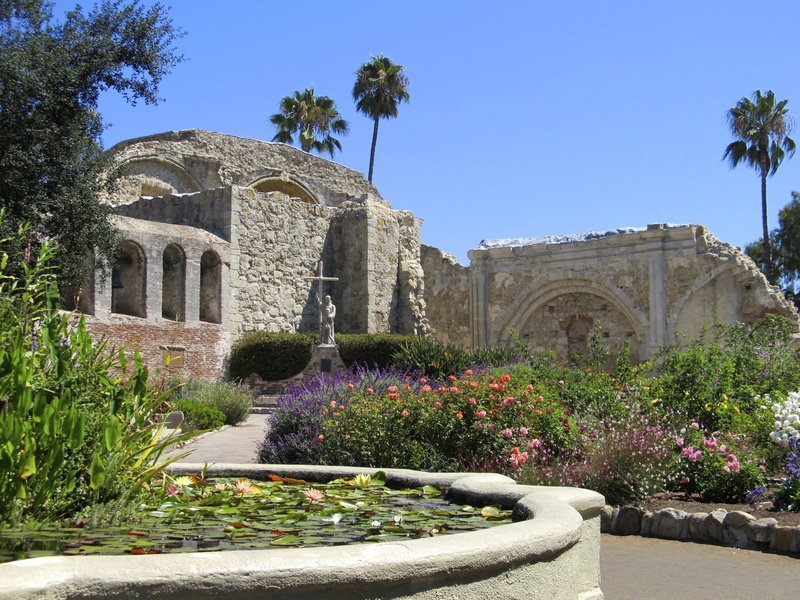 Old Stone Church and Statue of Father Junipero Serra. This next picture is my favorite from the mission. It is interesting to note that one of the needlepoint projects on display in the seminar exhibit area was exactly this scene from Mission San Juan Capistrano. 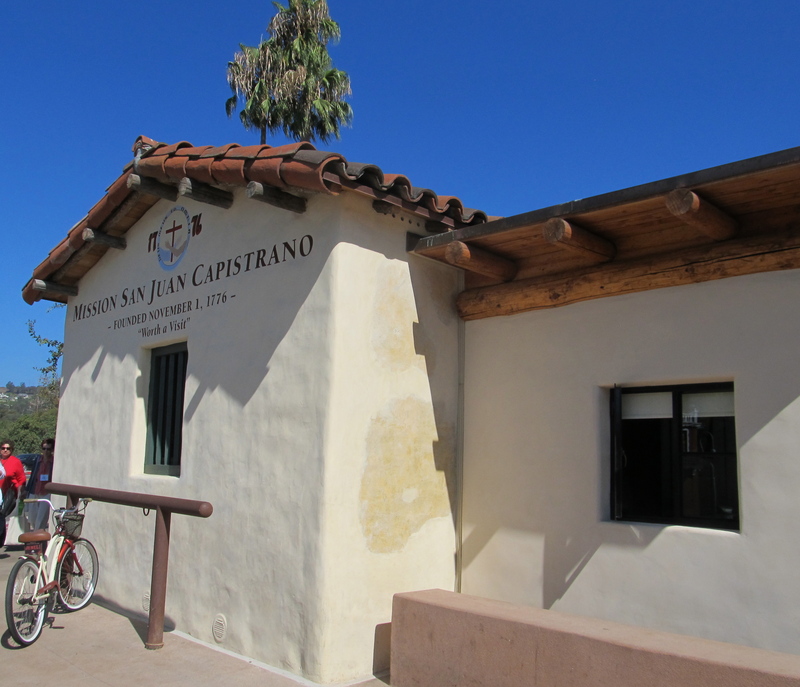 After our tour, we walked down the main street of Capistrano to an old building that houses the restaurant El Adobe. This was a favorite place of the Nixons. 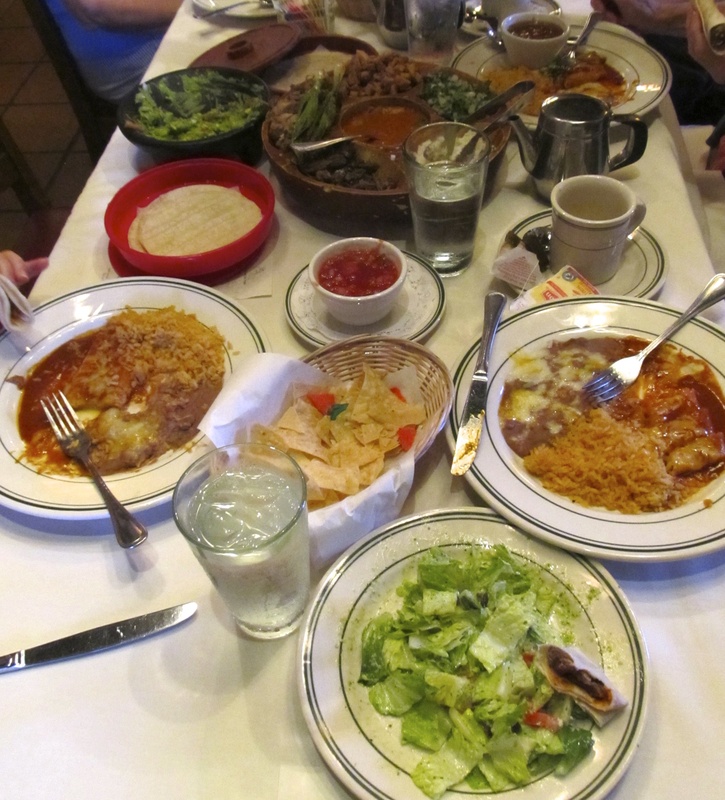 Anyway, we had a private room and were served the Mexican Fiesta — family style! 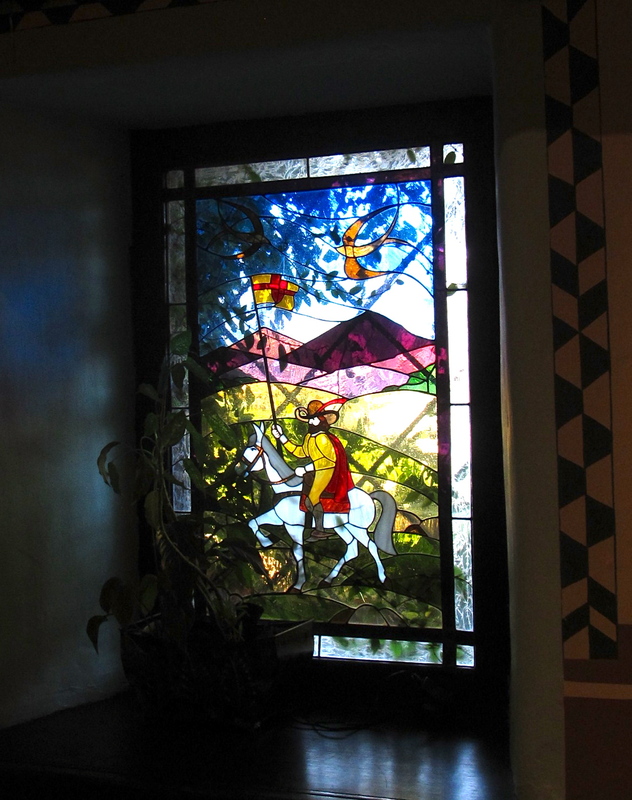 The window in our banquet room at El Adobe! We had Guacamole prepared tableside, followed by a Cilantro-Pepita Salad, then Taco Fiesta Platters (three kinds of meat), Cheese Enchiladas, and the most wonderful Sopapillas for dessert! I was so stuffed that I fell asleep on the bus ride home! What a wonderful day! I feel refreshed to begin my new class “Irresistible Iridescents” tomorrow morning. I think I’ll call it “I-squared”! Thanks for taking us along on your trip. I suspect way more than 14 people have enjoyed hearing about it. It does seem odd more people didn’t avail themselves of the tours. How cool that someone stitched the scene with the bells.